Humans and most animals have eyes that are round like balls. That means we can look up, down, left, and right without having to move our head at all. Owls, on the other hand, have eyes shaped like tubes. As a result, they can't move their eyes, and have to move their entire head instead. 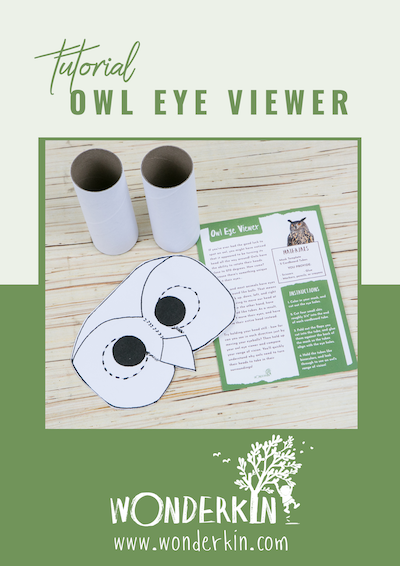 By creating an owl eye viewer you can experience an owl’s range of vision firsthand. Color in your mask, and cut out the eye holes. Cut four small slits roughly 3/4" into the end of each cardboard tube. Fold out the flaps you cut into the tube, and glue them against the back of the mask so the tubes align with the eye holes. Now it’s time to put your owl eye viewer to the test! First, try holding your head still - how far can you see in each direction just by moving your eyeballs? Next, hold up your owl eye viewer and compare your range of vision. You'll quickly understand why owls need to turn their heads to take in their surroundings! Order the Owl Box today!